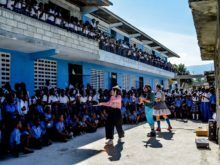 In December 2016, Clowns Without Borders Sweden and Clowns Without Borders USA collaborated to bring resilience through laughter to the disaster stuck communities on Haiti. In May 2016, Clowns Without Borders Canada and Austria traveled to Haiti to visit fragile neighbourhoods in Port-au-Prince. They created a new show about waste and civic education, and did some training. In November 2014, Clowns Without Borders Canada performed 8 shows for 6900 people in Haiti. In June 2014, Clowns Without Borders Canada went to Haiti and performed 7 shows for 9850 people.